AFC Rushden & Diamonds will head to Stocksbridge Park Steels tomorrow (Saturday) looking to extend their unbeaten run in the Evo-Stik Northern Premier League Division One South to 10 matches. Andy Peaks’ men haven’t been beaten in the league since they lost 3-1 at home to Chasetown in the opening week of the season. 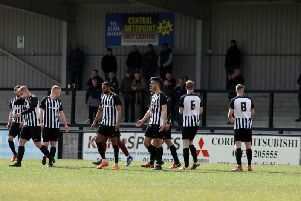 And they took their good run of form to a new level on Tuesday night when, despite being 1-0 down and down to 10 men following the sending-off of Rory Winters, they scored twice in the final 12 minutes through Richard Bunting and Jack Ashton to claim brilliant 2-1 success at second-placed Spalding United. With games in hand on most of the teams around them, Diamonds look to be nicely placed ahead of yet another busy month ahead. Another away trip to a team above them – Stocksbridge are sixth – is then followed by a shorter journey to bottom side Rugby Town next Tuesday night. And Peaks insists the aim for this weekend is the same as it was for the midweek clash at Spalding. “We are in a run of tricky games and it was great to come through another one on Tuesday,” the Diamonds boss said. “The one thing I have found out about this league is that there really are no easy games, every one of them has been tough so far. “We are expecting that again on tomorrow against another team who are above us and going really well. “But we will go there with the aim of getting something from. That was the target on Tuesday, we didn’t want to get beaten. Peaks, meanwhile, believes his aim of putting together a new-look squad that can be competitive at the level is virtually complete. And he insists their never-say-die attitude, which was in evidence again on Tuesday night, will stand them in good stead as they bid to challenge in the top half of the table. “The squad just has a strong look to it at the moment,” he added. “I made no secret of it. We lost a lot of players in the summer and it was always going to take time to get a new squad together. “I think we now have a team who believe in what we are doing, believe in each other and believe in the club.